A study published in Nature Communications investigates how the strong cooling of the North Atlantic Ocean impacted the European climate around 12,000 years ago. The findings could help scientists predict how climate change will exacerbate European heat waves and droughts in the future. 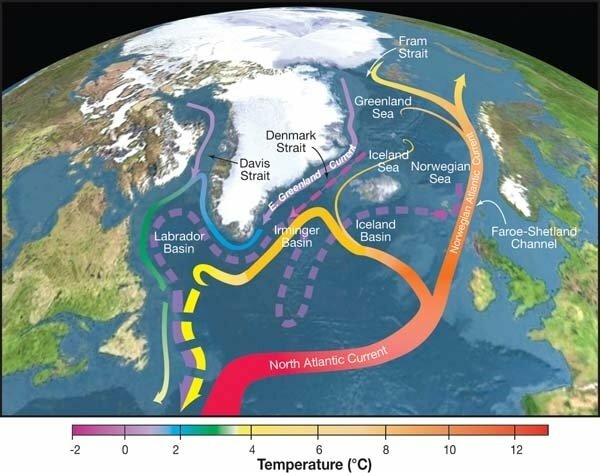 Ordinarily, an ocean current system called the Atlantic Meridional Overturning Circulation (AMOC) steers warm tropical waters into the North Atlantic, helping to keep Western Europe warm. But about 12,000 years ago, during a chilly period known as the Younger Dryas, the AMOC slowed down, which meant the North Atlantic cooled; climate models and reconstructions based on pollen and insect records suggest that Europe cooled, too. However, plant fossils and new simulations, collected and created by a team of researchers from nine institutions, including Columbia University, indicate that this picture isn't entirely correct. The study was led by paleoclimate researcher Frederik Schenk from Stockholm University. The authors modelled the global climate of the Younger Dryas cooling with at least four times higher spatial resolution than previous simulations. Their findings confirm Europe's frigid conditions in the winter and spring during this period. However, they also found that Europe's summers actually warmed up by 0.4 to 1.5 degrees Kelvin (about 0.9 to 2.7 degrees Fahrenheit), rather than cooling by several degrees. Plant fossils in lake sediment cores across Europe confirmed these findings. But how did summers keep warming despite strong oceanic cooling? The Fennoscandian Ice Sheet, which covered much of northern Europe in up to two kilometers (1.2 miles) of ice during the Younger Dryas, may have played a role. The team's climate simulations indicate that the cold air over the ice sheet created a high pressure system that blocked the cool winds coming off the North Atlantic from reaching the continent. In addition, the sunny, cloudless skies that came along with the high pressure system helped to make European summers warmer, says Francesco Muschitiello, a co-author on the paper and adjunct at Columbia's Lamont-Doherty Earth Observatory. The team's simulations are more robust for studying the Younger Dryas period, but they suggest that further slowing down of the AMOC could instead make heat waves more common in Europe's future. "There's a growing concern about how AMOC weakening is going to affect regional climate and weather extremes," says Muschitiello. "This study has important implications for our ability to predict heat waves and drought in Europe, as the models we use for climate predictions strongly underestimate blocking circulation, and therefore may under-estimate the impact of a weaker AMOC on European climate and water resources."